“A free and fair election is not determined only by what happens on Election Day, but by attitudes and activities in the run-up to the election. “While campaigning is fundamental to any election, character assassination is as devastating as is physical violence. We call on political parties to tone down their campaign rhetoric to reflect values of respect and encourage an environment of decency and dignity. “An election should not be about winning at all costs. That approach diminishes the electoral environment to a mere scramble for power which ignores decency and respect. “After the election, we still have to work together as South Africans to address the challenges of our society. We cannot afford for people to become cynical and demoralized as a result of negative campaigning. “ECCOC has been established to monitor and encourage compliance with the Electoral Code of Conduct, which encourages an environment of free and fair participation in the electoral process by political parties, voters and citizens in general. DAY THREE: At 6:40 am Bishop Vicente gathers eight of his clerics and church wardens to join us for Morning Prayer. We are later joined by two cathecists, and afterwards pay a courtesy call on the district governor, as has become the norm. Then we drive to the marketplace to buy seed and rice, as we did last week in Sofala Province when I visited the Diocese of Lebombo. As in Sofala, I learnt that solidarity has to be accompanied with food. The marketplace is busy and when the vendor realizes we are buying in bulk and for what cause, he gives us a good discount. Though this area is very isolated and has been struck by Cyclone Idai, coming from Makgoba's Kloof and Cape Town I could not miss being struck by the topography and beauty of this place. We are in the forest, amid thick, lush bush, ravines, hills and mountains – a rarity in the bulk of Mozambique so far. We make our first stop at Aqua Kente, which hot sulfur springs at the foot of Maramba Mountain. We are met by the local ruler, Queen Rosa Mamwenda, who is a delight and loved by her people. It was refreshing for me that there is at least one reigning queen among all the male chiefs that we have met at each village so far. We engage her and her subjects, listen to their story, share encouragement from Scripture and share seeds and rice with the village committee and the queen to distribute according to their system. We visit two more villages, Megaza and another. The key feature everywhere is that we are welcomed – and bid farewell – warmly in song and dance. Even in pain and total loss, the gift that they have not lost, nor are prepared to lose, is their song, dance and their hope. Another disturbing, and very sensitive, matter is the number of young children who have their own children. Everywhere, there are countless children. I didn't see a school or similar centre in Morrumbala. It is clear that the cyclone is rewriting the history of these people of God – all of a sudden sparse rural villages are becoming concentrated townships because of relocation. These agrarian communities will soon lose their identity, the safety of village life and who knows, their rivers may be exploited to supply others so they end up short of water in these upland settlements. I wish we could at least build a primary school in Morrumbala. After thanking the members of our team, we travel the 275 km back to Quelimane. There we prepare to say goodbye, but also to take the longings and prayers of God‘s people to God in prayer as I say Compline and the Examen, examining my conscience. When grafted into the situations such as those I have experienced in these days, I realise there is much I can de-clutter and so live more simply. DAY TWO: After breakfast and Morning Prayer – and reading Jeremiah 28:17ff – at our Quelimane guest house, I return to my room to catch up and study the disaster intervention plan from Niassa Diocese. As intimated yesterday, this diocese has dealt with flooding, food and health disasters before. They are amazingly well organized and deserve all the support they can get. Our departure to a district 30 km outside Quelimane city is delayed because of past conflict in the area, which means we need special permission to travel and a dispensation from the Governor. We get this and it commends us to the three district governors whose areas through which we will travel. We arrive at our first destination, we duly meet the district governor and he briefs us. Temporary tents, seed, food and instilling hope through prayer are his priorities. He assigns the district planning director to accompany us to transit camps and areas where the displaced are to be permanently resettled. It's raining again today and the camps are wet. Indeed more tents are needed, since some families are squashed together in one big tent. Drinking water is being piped to tanks in these camps and a less than adequate sanitation area has been set aside. People are traumatised – not only have they lost all, but relocating to new sites allocated by the government also means losing their connection with their dead, who are buried in low-lying areas. The chief in one such relocation area, Chief Frans, is impatient because he agreed to be relocated but is now a chief without his people as some are resisting the relocation and others are taking far too long to be moved. He blames officials. About 4300 people are to be relocated. Charities are bringing more truckloads of food. We then travel more than 275 km to Morrumbala district along a pot-holed road, the last 50 km of which is gravel. It is raining persistently now and the road becomes a shallow river. At Morrumbala we are welcomed by clergy and Vida groups, who are calm and impressive in their interventions. All are relatively young, and left their families some time ago to assist in this area. The land on which some communities lived is completely flooded, as are the churches. The grave of Bishop Charles Mackenzie, the missionary bishop who, along with a number of members of his party, died of malara here in 1862, has been “drowned” under water. The grave is in the village of Chilomo, which is covered by water as a result of flooding from the Shire River. Those affected went to their relatives to seek shelter. What is needed now are seed, food, plastic to cover the thatch of makeshift shelters, and mosquito nets, since this district is full of malaria. We will buy bags of supplies tomorrow. Bishop Vicente is worried about the districts around Maganja da Costa and Chinde, which are on the coast respectively north and south of Quelimane. They are not accessible and Bishop Vicente fears that since they are out of sight, they will be forgotten. At the end of a long day, we have dinner and pray for strength, for good weather and tomorrow's program. We retire in Morrumbala at a bed-and-breakfast. I use a lot of Tabard to discourage mosquitoes because I find the net claustrophobic. 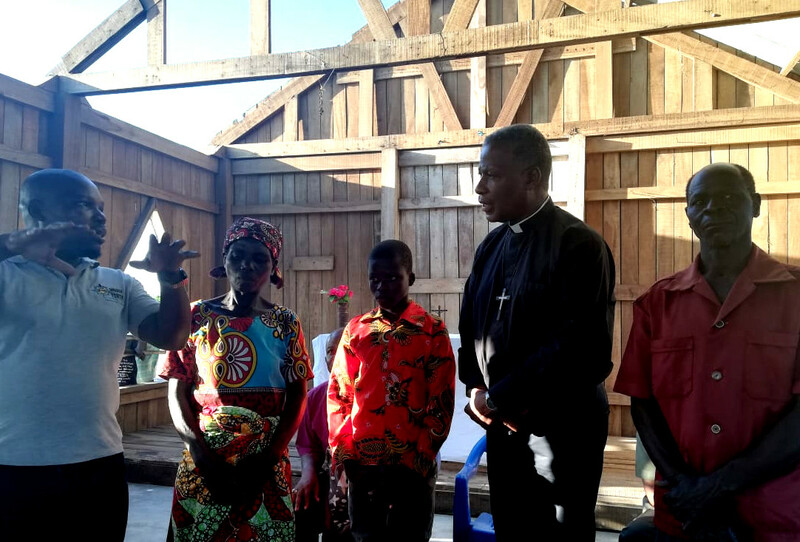 Do you and your congregation want to help the dioceses in Mozambique recover? DAY ONE: The alarm rang at 4:20 and by 5 am Uber is here to pick me up and take me to Cape Town's airport, where we board for Johannesburg at 5.50. Heavy mist delay the flight – fortunately all flights, and we were in Maputo by 11:20. 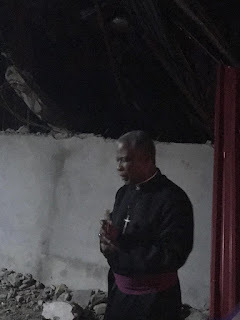 Along the way we meet Bishop Zipho Siwa, the Methodist Church's Presiding Bishop, and his team, who are also visiting congregants affected by Cyclone Idai. Boarding for Quelimane is scheduled for 11:30 but we finally depart at 14:15 and while waiting I read a piece in the Anglican Theological Review on preaching. 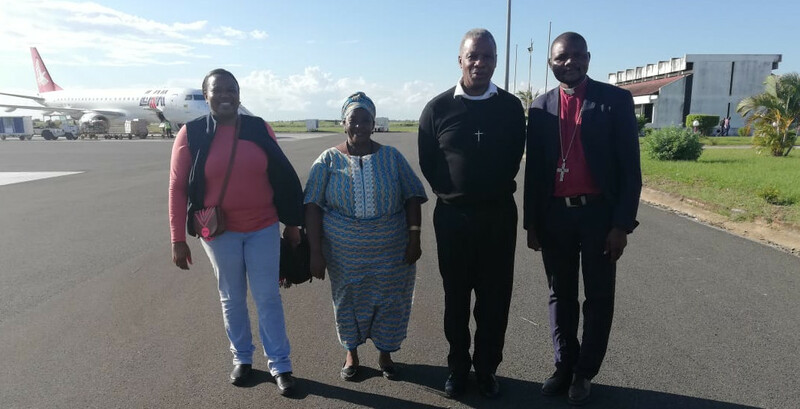 Upon arriving in Quelimane, which is in Zambezia Province, Bishop Vicente and the faithful are waiting as always to welcome us, and Matlotly Mototjane, the Provincial Executive Administrator, immediately gets into her note-taking and recording mode. We go straight to the office of the Governor of Zambezia and are welcomed by his officials and the director of disaster management, who brief us on their plans and needs, together with the representative of the Governor. They need seed, food, medication, shelter and whatever support they can find, especially in areas which are still inaccessible. We go for a meal and connect with Bishop Vicente‘s team. He is well organized on the ground, with Vida (“Life”) teams, supported by other NGOs and ecumenical partners who are handling information, distribution and support. The teams were formed a long time ago to deal with malaria, HIV/AIDS and other community work. Now they are using their community engagement skills to intervene during this climate and humanitarian disaster. We are joined by the Governor’s assistant, two archdeacons, a PCC member and the PCC treasurer. Quelimane is buzzing with international, multilingual and multiracial experts and the hotels are full, so we are lucky to get guest house accommodation in the city Centre. Bishop Vicente left home on Monday to get here, driving 1200km one way and will drive another 1200km in order to lead a Palm Sunday service. He calls home and he relates how his one-year-old daughter recognises his voice and says “Papa, Papa.” Vicente is the youngest bishop in our Province. He did not need this climate change-induced disaster over and above the usual challenges of his huge rural and poor diocese. Compared to when I last saw him four weeks ago for the inauguration of the Missionary Diocese of Nampula, he looks exhausted but he still manages to smile. Tomorrow we travel by road for 275 km to visit communities devastated by the cyclone, and will return on the same day. Bishop Vicente appreciates the solidarity and our visit. We are following the rhythm of breakfast, morning prayer and a walk of witness to the displaced and otherwise affected. Engaging people, via a translator, on their experiences. Wednesday April 3: The words, “Archbishop, we are hungry,” stayed with me overnight as I battled with sleep even after a long day on Tuesday. The instruction from Jesus replayed in my mind, especially during Compline – “Feed my lambs,” and “Feed my sheep,” (Jn 21:15-17), as did Jesus's words in Matthew's Gospel that when we feed those who are hungry, we feed him. (Mt 25:37-40). 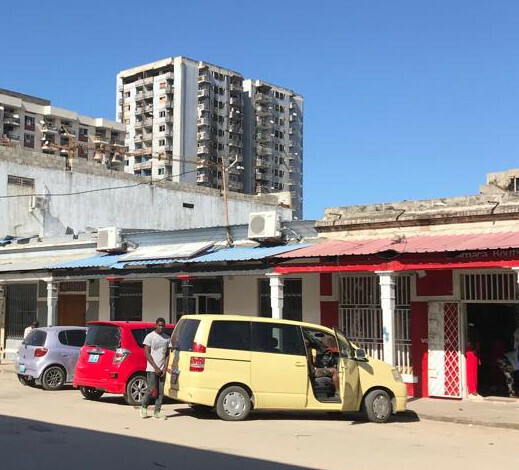 After waking in Beira on Wednesday to the sound of the generator which provided electricity to our hotel, we had breakfast and said an abridged Morning Prayer, reading from Jeremiah 18:1-11. We connected with the local team of clerics and churchwardens who accompanied us throughout the trip and went to the local supermarket, where we bought the emergency food packs recommended for for 31 families at St Mary's, Mutau. Town was full – and filthy in the aftermath of the cyclone, with hammers banging everywhere as people fixed their roofs. After this we reflected on how to mobilise urgent resources and met with like-minded organisations for medium- and long-term intervention. Behind the church in Beira, we gathered with a Tearfund team of eight from the region and the UK, and with Mennonites and Anglican teams, as well as with the SA National Defence Force represented by the Chaplain General. Sitting in a circle under a tree, it was indeed good to pull together and commit to what each will bring. 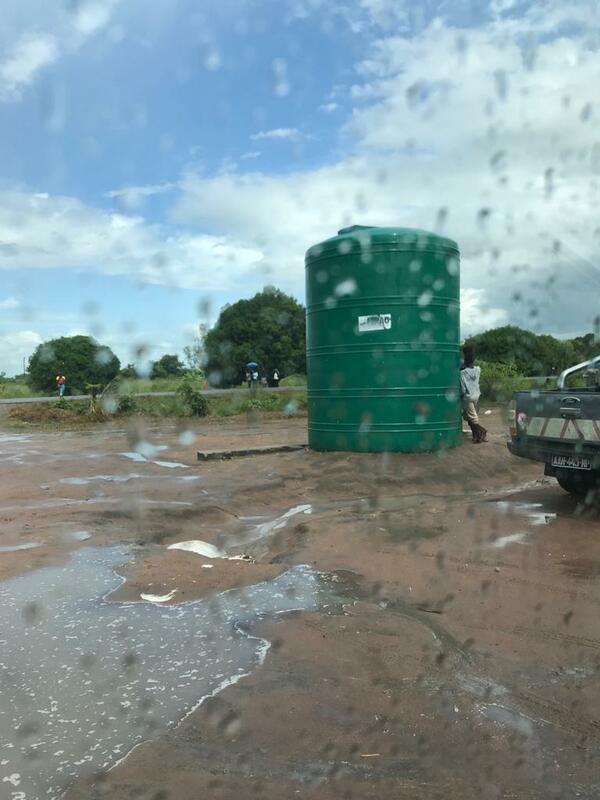 The key needs were food and water purification tablets, followed by capacity-building exercises, counselling and materials to rebuild infrastructure. Then we were whisked to the airport after saying good-bye to our team members. At the airport, I shared in an interview with the local TV station my impressions, my tears, my worries about waterborne diseases, and an appeal that the people of this region should not be forgotten and that help should keep on coming. We hopped onto the South African Air Force plane and flew home, joined by two medical doctors and a professor who is an expert in waterborne diseases. On arrival, we were met by the Chief of the Air Force, General Msimang, and briefed him on our visit. He in turn thanked us, took us around the airbase where we landed and shared their work. As we were talking, a plane took off for the DR Congo, and I became aware that the SAAF does a lot of work that I was not aware of, including youth training programmes through winter and summer schools, all, I hear, on a tight budget. Once the water subsides, the possible trauma of finding the bodies of those so far unaccounted for and laying them to rest will require counselling, resources and support. It is still the rainy season, so when the water levels drop I hope people will be able still to plant new seed. Thank you everyone for your prayers and please keep on giving to our Province's Disaster Fund (details below). Thank you also to General Shoke, the Chief of the SANDF, to General Msimang and to the Minister of Defence, Nosiviwe Mapisa-Nqakula, for enabling our mission, as well as their men and women and other teams from South Africa who are helping on the ground. Give us peace, for Jesus Christ’s sake. Buying emergency food packs for families at St Mary's, Mutau. Please give generously for what will be needed ahead. Tuesday April 2: We started the day with breakfast together and said a shortened Morning Prayer, reading from Jeremiah 17:19-27. The dining hall was full of all sorts of NGOs' reps and rescue people. We drove to the airport, where we were received by a Mozambican official responsible for justice, the constitution and religious matters, who appreciated the role of the church in the crisis after Cyclone Idai. The airport is a veritable marketplace for journalists, NGOs and choppers. Col IH Zurich of the South African Air Force and the SA Defence Attaché, Col P Nkambule, welcomed us and Col Zurich briefed us on the day ahead. We flew to Gwaragwara and Busi, seeing from the SANDF helicopter the after-effects of the cyclone – water as far as the eye can see. Water is sacred, as I always say, and in this context it is too – but too much of it is destroying the fields and displacing people, as we saw in transit camps. Medical teams are confirming that the waterborne disease, cholera, is now emerging in an area which also has lots of malaria. Returning to our base at Beira, we held a service for the South African team helping the Mozambicans and connected with the South African charity, Gift of the Givers, who are also helping here. Then we were taken through a camp helping displaced people and saw its medical facilities – one of the helicopter pilots was feeling ill and was admitted there. We returned to St George's in Beira, this time in daylight, and were able to see how their new church building had been destroyed. We visited Archdeacon Narciso Langa of Pungue and his family, who operate a school at the rectory there. After lunch we drove more than 50km west to Dondo, on a road which was intact but where electricity lines were down, roofs were blown off and trees blown over. In this region, 11 churches are damaged to varying extents, and a health centre and 13 diocesan schools have been affected. In Dondo, we hit the hidden and the forgotten, a deeply rural area where houses are flattened and roads full of holes (and our backs are sore). As we arrived at St. Mary's, Mutua, the singing of the welcoming congregation soothed us. 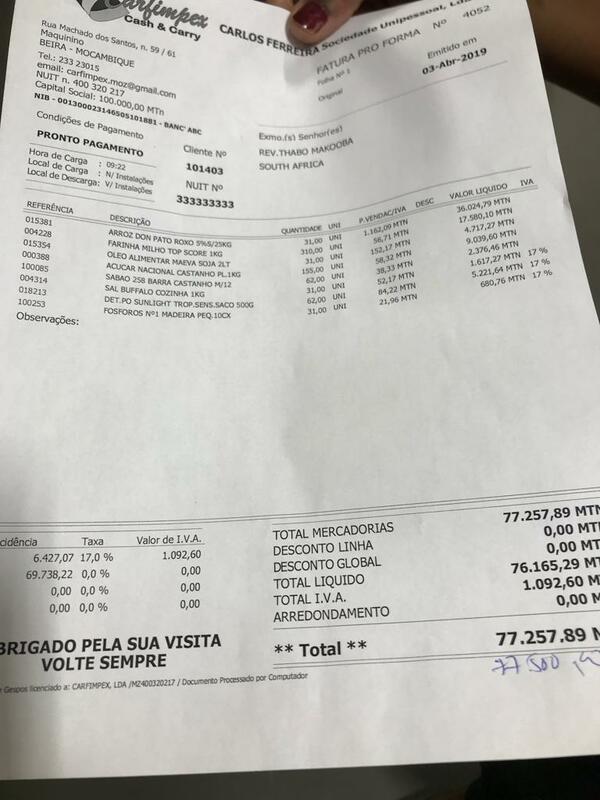 Two classes with scheduled school times have 400 children, and only classes are affected. In the rebuilding and rehabilitation phase that must now follow, the archdeacon’s work becomes critically urgent. 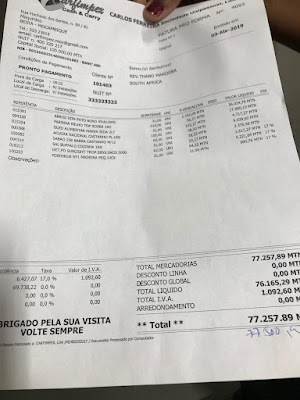 He used to travel on public transport but Bishop Carlos agrees that he now needs a vehicle and estimates that this will cost the Diocese about 8,000 U.S. dollars. They will also need seed to plant, and bricks, mortar and zinc to rebuild damaged churches, schools and a health centre which serve whole communities. On the way back to Beira, we stopped at a village after a long journey, after which the back of the van accompanying us is filled with more than 20 children. We are guided on an alternative route to that usually taken by the priest, which is now flooded. We leave the tarred road and hit gravel. In midst of all this, the water lilies are blooming purple and white, saying all will be well. People are attempting to return to normality and schoolchildren are back to school and playing. Hope AFRICA and Green Anglicans continue to share useful information on the situation, as is Matlotly who is with us. We headed back to Beira having given people some hope, but not food and shelter. Bishop Carlos says we can go on and on as we are, but experiencing the same pain and suffering. Matlotly says there is no proper sanitation and is worried about the resulting illnesses, especially among the many children. The Chaplain General remarks on how people have nothing and depend on Providence. After the long trip back from St Mary's, we return to our accommodation. The refrain from the Chaplain General and all of us is that we must feed the people of Mutua sooner rather than later. We arranged resources and agreed on what I should purchase – hampers for 31 families will cost R22,000. We agree that is the way to go and will arrange this before I leave Beira. We will also arrange with Team South Africa to turn their eyes to this area. Monday April 1 - After waiting for four hours to get clearance to enter Mozambique airspace, we left Pretoria for Beira, accompanied by the SANDF Chaplain-General and the Administrator in the PEO's office, Matlotlisang Mototjane (who is also a disaster management expert). We were received in Beira by a representative of the governor of Sofala Province and Col Zurich of the SANDF, and then were whisked into St George’s Anglican Church, where Bishop Carlos Matsinhe was leading Mass. St George's had recently built a new church, but alas the church is now in ruins. We held a moving service, joined by the two SANDF pilots, the chaplain-general, clergy of the area and local parishioners. After Mass, we dedicated to God the fruit of the labour of the parishioners among the ruins, and symbolically took down a brick to signify that we will fully demolish the ruined new church and rebuild again. In my message to parishioners, I recalled how the Temple in Jerusalem took time to build, how Christ is the cornerstone and how, after the flood, there was a rainbow. We then went to eat, agreed on the schedule for Tuesday and retired to our accommodation. Even at night we could see how old and established trees were uprooted from the ground and now lay flat. Palm trees are resilient but were flattened too. "Theology from Below: A Personal Journey"
Good evening. And for those from other parts of our country, our continent and the world, welcome to the beautiful Western Cape. It is exciting for me to be among all of you, postgraduate students and researchers from many different backgrounds and contexts, here in Stellenbosch tonight. The conference organisers have asked me to tell my own story, including my journey as a young person entering the world of theology and the church, in the context of theologies that are speaking from the margins and challenging those “at the top”, or theologies concerned with Africa and the Global South. You may think it strange for an Anglican Archbishop to pontificate on theologies which are speaking from the margins. After all, I live and work in a large mansion, originally built by a Dutch settler, in Bishopscourt, the wealthiest suburb in Cape Town, on a big estate originally settled by the first Dutch colonist who arrived here in 1652. I lead a church which has its origins in the arrival of British colonialism and is associated with an empire which not only oppressed the indigenous people of this country and continent, but in its greed for gold, waged a war during which both black South Africans and Afrikaner women and children were locked up in some of the world's first concentration camps, resulting in the death of tens of thousands. And although the days of the Anglican Church being the church of the Anglo establishment in South Africa are long gone, I still have a pulpit at St George's Cathedral, across the street from Parliament, which attracts television news crews to report on my sermons at Christmas and Easter. Not only that – I am speaking at a university which has sometimes been called “the cradle of Afrikaner nationalism”, the ideology which – partly in response to British imperialism – spawned the policy of apartheid. So I speak to you tonight from within the context of a church and a university which carry a lot of baggage from the past. Given that context, what can I say that will be of any value to you, starting out on your own theological journeys? Well, to be honest, I don't know. That will be up to you to decide once you have heard my story. I was born in the far north of this country, into a clan we refer to as baTlou – the People of the Elephant – in a lush valley of forests and waterfalls called Makgoba's Kloof. It is a place of extraordinary beauty, a beauty celebrated in English literature read far beyond these shores. But for baTlou, it is also a place of extraordinary pain, for it is there that my great-grandfather, Kgoši, or King, Mamphoku Makgoba, was put under siege when he defied orders from the government of the South African Republic in the 1890s to get off our land and allow white farmers to take possession of it. For years my great-grandfather managed to fight off or dodge the settlers – mostly Boers, or farmers, from the republic, but including others from Britain, Germany, Austria and Denmark. Once he escaped from a prison by digging his way out. But eventually, our clan's troops – who numbered about 200 soldiers – were defeated by a force estimated at somewhere between 4,000 and 7,000 men. The people who caught up with my great-grandfather were actually African auxiliary troops, and to prove that they had killed him, they cut off his head. A local photographer took a gruesome – his head looking like that of John the Baptist on a platter. Announcing Kgoši Makgoba's death to Pretoria, the Boer general responsible ended his telegram with the words: “The Lord reigns, and I am his servant.” The skull subsequently disappeared and we are still trying to find it, nearly 125 years later, so we can give my great-grandfather a proper burial. To summarise the history in current South African political language, our land was expropriated without compensation by force of arms. Sixty-five years later, I was born in one of the areas to which our clan was banished after 1895. But my birth was actually registered in Johannesburg, where my parents were living and working at the time. This was a direct result of apartheid – if my birth had been registered where I was born, under the pass laws which restricted the movement of black South Africans, I would not have had the right to live or work in Johannesburg. My father had migrated to Alexandra Township, on the outskirts of Johannesburg, at the same time as Nelson Mandela did, in the early 1940s. In Madiba's words, while Alexandra had “some beautiful buildings, it was a typical slum area — overcrowded and dirty, with undernourished children running about naked or in filthy rags” and teeming with “all kinds of religious sects, gangsters, and shebeens.” Life was precarious but also exhilarating: again in Madiba's words, “Its atmosphere was alive, its spirit adventurous, its people resourceful." My father was a minister of the Zion Christian Church, now South Africa’s biggest church, which allows polygamy, and my mother was his third wife. He wasn't paid a stipend – he made his living by buying goods at a wholesale store in Johannesburg and travelling to mining compounds where he sold them to black mineworkers on the gold mines. So given my background, how did it happen that I, from a clan which fought against white oppression, the son of a polygamist, and coming from an area of the country which was the headquarters of Southern Africa's most powerful syncretist church, come to be a mainline Christian, moreover one who was at first an adherent, then a priest, then a bishop and eventually an archbishop of the established church of the empire whose dominion over my country, my people rejected? There are a number of answers. The first one is tied to education and the fluidity of denominational affiliation. While my mother was loyal to my father's church, she was ambivalent about the ZCC when it came to her children. Also, although her parents were in the ZCC when she met my father, her mother had originally been Lutheran and her father Dutch Reformed. So when the time came to send her children to school, she had no hesitation in encouraging us to join the churches associated with schools that were thought to provide the best education. In that way, my older sister became a Catholic and I was baptized in the Anglican church in Alexandra. I went on to play an active role there, and later, when our family was forcibly removed by the apartheid government to Soweto, at the local Anglican Church in the Pimville area of Soweto. But if you ask me what influenced my spiritual development most powerfully, the first incident I can put my finger on was when, aged 15 and just after the Soweto Uprising, an armed personnel vehicle filled with soldiers chased me on my way to school, accusing me of being a terrorist. A local mechanic gave me shelter, letting me hide under one of the cars he was repairing, while he courageously went out and, at the risk of his life, argued with them until they went away. That frightening experience marked a conversion in my life, a time when I realised that it was only by the grace of God that I had survived not only that experience but the years of growing up in a gangster-infested township in which we sometimes walked past the corpses of crime victims in the gutters on the way to church on a Sunday morning. Later, when I lived in Soweto but still went to school in Alexandra, I was deeply moved by the worship every Monday to Friday on the commuter train from Soweto to town, where the same group of passengers sung beautiful African choruses on their way to work each day, listening to itinerant preachers, whose sermons and prayers spoke to their congregants' sense of desperation, pain and fear but also to their hopes. Aged 18, I offered myself for ordination to the Bishop of Johannesburg, but he sent me away, saying I should first go to university and study anything other than theology. While I was a student I continued to be involved in local parishes, teaching Sunday School, becoming a lay minister and then exploring my vocation with others who felt called to the priesthood in what in the Anglican Church we call a Fellowship of Vocation. 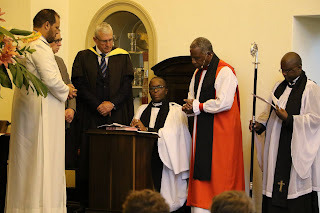 During university holidays, I worked in the photocopy room at the South African Council of Churches, which had given me financial aid for my studies, and there I was attracted to the rhythm of daily morning prayers and regular communion which Desmond Tutu insisted upon. I was also deeply involved in the Anglican Students' Federation. But in spite of all this, I was confused over whether I was called to the priesthood. The others in the fellowship all felt they had met the Lord in some way, while I wasn't so sure that was my calling. Besides that, at university the subjects I was most interested in were science and chemistry, and my teachers were urging me in that direction. Working against that impulse, however, was the revolutionary tumult that we went through in the 1980s. The struggle against apartheid was approaching its final stages, and I became involved in the agitation of the time. During the Soweto Uprising, my main contribution to the struggle had been “liberating” a bag of mielie meal from a Chinese-owned shop in the first few days of the rebellion. (I denied this vigorously when the police caught us, but since I and the other boy who had stolen the bag were covered in white mielie-meal, our denials weren't believed. Fortunately the police were too overwhelmed to keep us in custody.) But when I got to university, first the University of the North and then Wits in Johannesburg, I became involved in the agitation that was characteristic of the time, and I became active in the Release Mandela Campaign. I even considered leaving the country for military training at one stage, but Desmond Tutu told a group of us we could be just as useful organising young people at home and teaching our communities about our struggle. In the end what inspired me most was seeing people like him, together with the Anglican activist Helen Joseph, the other former SACC general secretary Frank Chikane and the Afrikaner dissident Beyers Naude in action, passionately addressing large crowds of chanting young people in stadiums, preaching the eternal ideals of our faith, the values of the Bible and its demands for justice and peace. So I allowed my name to go forward to the selection conference at which the Diocese of Johannesburg chose who to send to theological college. Somewhat to my surprise, I received a letter from the then Bishop Tutu, who had recently been elected Bishop of Johannesburg, telling me I was being sent to theological college. At college and beyond, what inspired many of us was the way in which church leaders leading the struggle against apartheid, and for democracy, justice and the true peace – the shalom – which comes with justice, was their focus on people on the margins of society. Desmond Tutu is well known for telling the story of how when missionaries came to South Africa, we had the land and they had the Bible. They said, “Let us pray,” and we closed our eyes. When they finished praying, and we opened our eyes, we found they had the land, and we had the Bible. But what is not so well known is that Bishop Tutu went on to say that in getting the Bible, we got the better deal. Because, to paraphrase him, he used to say that in a situation of injustice and oppression, there is nothing, just nothing that is more revolutionary than the Bible. For the Bible says that each of us is made in the image of God, that each of us is a God-carrier, and that to treat any child of God as less than this, no matter how marginalised they may be by society, is therefore not simply unjust, not simply painful for the one so treated, but it is blasphemous – like spitting in the face of God. The power of such condemnations of injustice still have resonance with us today. When I was ordained to the ministry, I was ordained a deacon before I was ordained a priest. When I was made a deacon, I was charged with a special ministry by my bishop. He told me that, and I quote: “In the name of Jesus Christ, you are to serve all people, and to seek out particularly the poor, the weak, the sick and the lonely.” My subsequent ordination as a priest, my consecration as a bishop and my installation as an archbishop have not changed that mandate. In my book, Faith & Courage: Praying with Mandela, I explained it like this, and I quote: “I remain a deacon, as all priests do, so my task remains to seek out the poor and needy, to seek out those who need God’s healing love and touch, and to be especially worried about those who are suffering.” For biblical scholars, Jeremiah would say “Is there a balm in Gilead?” Are there people out there who can really understand these things? 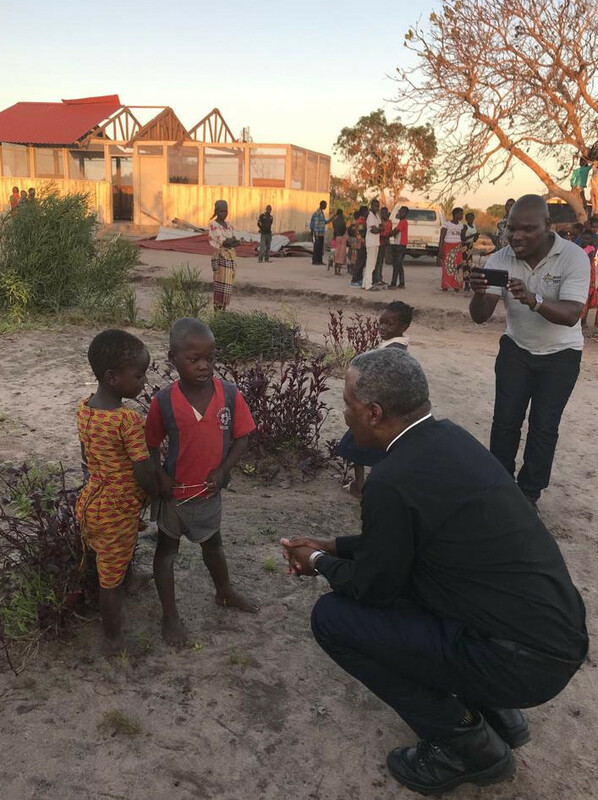 “My vocation as a deacon also underpins my passion for restoring the church’s role in promoting good, affordable education across Southern Africa. It also fuelled my anger at the appalling conditions in the mud-brick schools of the Eastern Cape, which I visited in the company of a delegation of prominent South Africans to find disgusting toilets, no hand basins, broken windows, holes in classroom floors and too few teachers. This vocation is why, as chancellor of the University of the Western Cape, I reached out to negotiate with students during their #FeesMustFall protests, and why I identified with our son, Nyakallo, when he was arrested during them. And a deacon’s concern for the poor and the needy is why national religious leaders and the SACC spoke out so strongly against the corruption and misappropriation which resulted in the public's money being stolen from the poor and going to line the pockets of the powerful during the administration of our previous president. The challenge of inequality may be particularly acute in South Africa, where by some measures we have the worst gap between rich and poor in the world. But it is of course a challenge to you all as well, whether you are from a more impoverished part of Africa than South Africa or from the materially wealthy societies of the Global North. For that reason anyone concerned with theology from below has to address theologies of the economy. Some years ago I took part in the first Ecumenical School on Governance, Economics and Management, in Hong Kong, where we asked how we could establish an alternative to the current global governance of money and financial systems, replacing it with a system that would be less exploitative and would distribute resources and income more equitably. As I said at the time, this sounds impractical, but as stewards of God’s creation we know that nothing is impossible with God. There is a sense that every doctrine in theology is part of the doctrine of God. Thus, systematic theology is not only about creation, providence, salvation and consummation but also about God creating, God providentially governing, God saving and God consummating creation to be the temple of his Triune glory. God’s theology and God's wisdom about God's nature and all things in relation to God are simple and eternal. Our theology, our wisdom regarding God and all things in relation to God is social and historical. For this reason, theology from below should reflect an interest in history – in theology as taught and transmitted through time. It is our collective responsibility through faith to seek to understand the mysteries that God has revealed in God's Word. We learn from the early parents of the church and the creeds which are the fruit of their ecclesiastical labours. Having said that theology from below should reflect historical interest, it should be concerned with teaching what the church must believe and do – not simply what the church has believed and done. That said, the church cannot know what it must confess in our day and age unless it knows what the church has confessed in other days and ages on the basis of scripture. History teaches us that inequality and injustice need to be addressed for the common good, and real change and true justice can only come from below, from the people. As disciples of Jesus we must promote truth and justice, equality and life at all costs, even if it creates conflict, disunity and dissension along the way. To be truly biblical as church leaders and theologians, we must adopt a theology that millions of Christians have already adopted – a theology of direct confrontation with the forces of evil rather than a theology of reconciliation with sin and the devil. It is from this understanding that in recent years, the church in South Africa has confronted the powerful, standing up against corruption, inequality and the like. The various commissons of inquiry into corruption and misgovernance which have been sitting in recent months have confirmed that we are emerging from an era in which those who benefited from the status quo were determined to maintain it at any cost, even at the cost of other people's lives. They benefited from the system because it favoured them and enabled them to accumulate a great deal of wealth and maintain a high standard of living. This happened at the expense of much larger numbers of people who did not benefit in any way from the system – those treated as mere labour units, paid well below a living wage, some separated from their families as migrant workers. This demanded, and continues to demand, confrontation with the forces of greed and self-accumulation which have characterised parts of both the public and private sectors. “I am a Christian and I remain a Christian because I remember that our faith begins with a young Palestinian on a donkey. I draw this phrase, and some of my reflections on it, from the memoir written by Denise Ackermann entitled Surprised by the Man on the Borrowed Donkey. The image conjured up by Denise’s title tells me that since Roman times we have perverted the Word and the mission of Jesus Christ, and its message about what God is up to in our world. Over the centuries we’ve allowed ourselves to be pointed to imperial agendas. Christ’s message has been attached to national flags, to military might and to the AK-47. Thank you for listening to me, and God bless you. On behalf of the Anglican Church of Southern Africa, and on my own behalf, I offer our deepest condolences and express our heartfelt pain at the loss of life and property caused by the destructive effects of Cyclone Idai across Southern Africa. 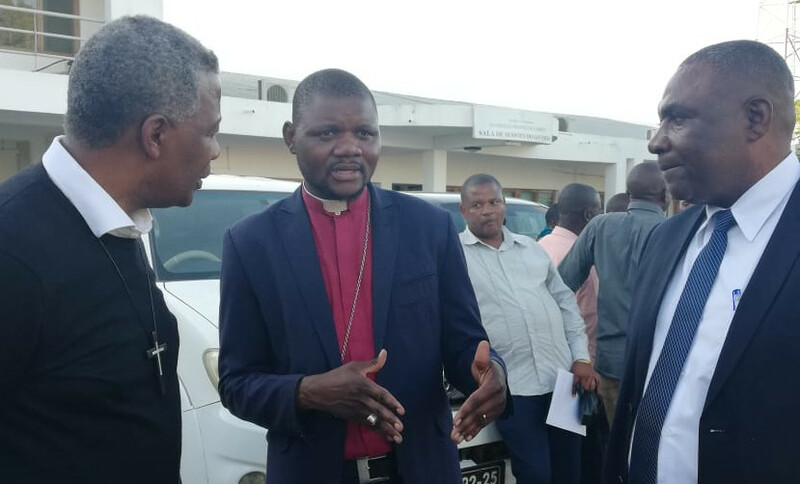 We want to assure the affected Dioceses in Mozambique - the Diocese of Lebombo led by Bishop Carlos Matsinhe and the Diocese of Niassa led by Bishop Vicente Msosa - of our prayers. Please pray also for the Dioceses in Malawi and Zimbabwe in our neighbouring Province of Central Africa which were affected. I appeal to Anglicans across Southern Africa to donate generously to ACSA's Disaster Relief Fund in order to provide relief to those in devastated areas. May I speak in the name of God, who is Father, Son and the Holy Spirit, Amen. 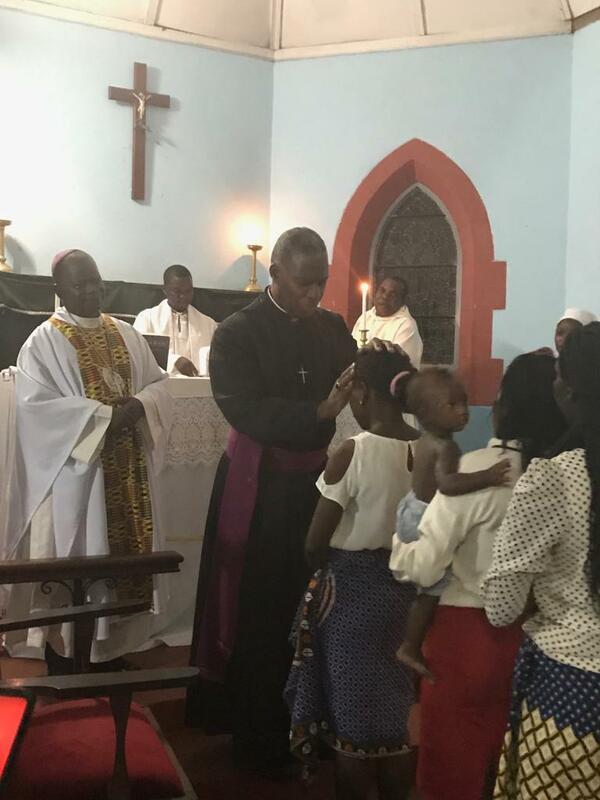 Your Excellencies, Bishops, distinguished guests, clergy and people of God, it is a great joy for me to welcome you to this service as we give thanks to God for this very important milestone in the history of Niassa – the birth of a missionary diocese of Nampula. It is also an honour and privilege to celebrate with you at this historic moment. Thank you everyone for the wonderful, warm welcome we received on our arrival here. Thank you, Bishops Vicente Msosa and Manuel Ernesto, together with your entire teams, for envisioning and planning this day. Thank you to the Provincial teams for the visits here and their guidance in ensuring that all the requirements for the new Diocese are met. Thank you also to those who gave off their time and were involved in the preparations for this service. We thank God for the faithful who have kept the Gospel light burning here through their lives, their zeal, their prayers and their service and witness. Today, I especially thank God for his faithfulness to you who have made it possible for this Diocese to be inaugurated as a missionary diocese. We are able to gather here today because the Provincial teams that have visited have looked carefully at the challenges you face and have recommended the formation of the new Diocese as the appropriate way to help you meet those challenges. 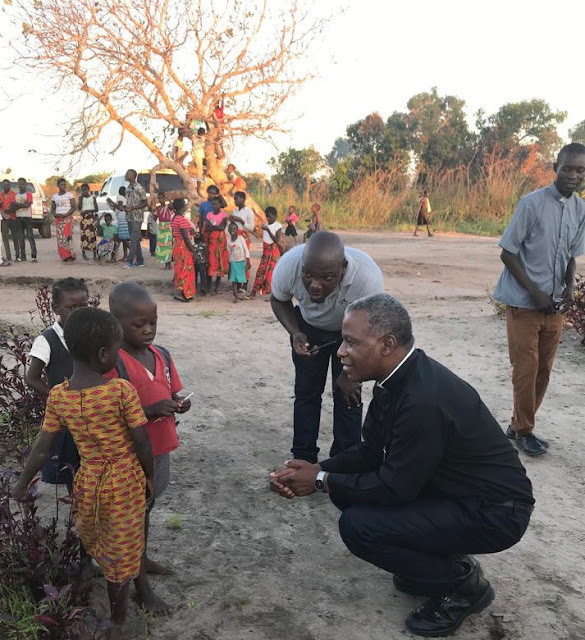 I also want to acknowledge with gratitude the efforts of our mission partners [the Mozambique and Angola Anglican Association (MANNA) and the Angola London Mozambique Association (ALMA) in the Diocese of London]. And of course our thanks must go also to the Bishops of Niassa who have laid the foundations for today over the past 30 years – Paulino Manhique, Mark van Koevering and Vicente Msosa – as well as the grandfather of the new Diocese, Bishop Dinis Sengulane of Lebombo. In approving the new Diocese of Niassa and the Missionary diocese of Nampula, we have taken note of the huge area in which you as the Church in northern Mozambique minister. We have also noted the large number of chapelries that your parishes have and the impressive number of Catechists who help your Clergy to minister to your people. 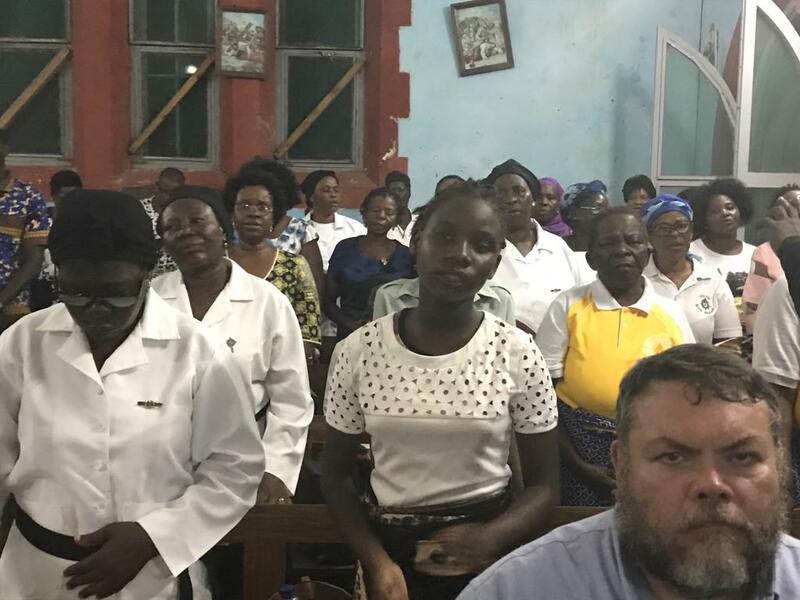 The last team which visited you found overwhelming support for establishing a missionary diocese of Nampula, and believed that such a step would enhance the work of the Anglican Church, and enable it to grow and flourish in this part of Mozambique. So we thank all those involved in many different ways in getting us to where we are today. But above all, our thanks go to God for his sustaining care for you, particularly during the turbulent times of the past, and for affording you this time of great hope and opportunity, even though of course it comes with its own challenges. In our first reading today (2 Chronicles 7:11-18), the Chronicler gives us God’s comforting words to Solomon yet again. When he appeared to Solomon, the Lord emphasised the importance of obedience to the covenant in order to experience its blessings, rather than to suffer its curses. Obeying the covenant was particularly necessary as Solomon’s kingdom grew in influence and wealth, since prosperity brought with it a lot of potential for breaking the covenant. So God needed Solomon to walk before God and observe God's decrees and laws in order for Solomon to establish his royal throne. This happened after David had gathered all the Israelites before him and before God and narrated how God had chosen Solomon to continue the work of building the Temple for God after him. Just as Moses received the plans for the tabernacle from God, so also David received the order from God that Solomon should build the temple. David gave Solomon definite directions on how he should erect the temple and ensure that the sacred vessels were carefully constructed. He was careful to mention that these were not his own ideas, but that he had been guided by divine revelation. As you and I today, in the new Missionary Diocese of Nampula, continue with God’s work, just like David and Solomon we too need God's authority and to be led and encouraged by His Spirit. So, Friends as we inaugurate this diocese it is my prayer that you continue to seek authority and guidance from God at all times and in all situations. The Gospel reading (Lk 19:1-10) also gives us another picture of a wonderful God whose love has no boundaries. The action of Jesus in recognising Zacchaeus is an example of what is possible as a result of God's unmeasurable love. As a tax collector, Zacchaeus collected as much money as he could so that after paying over to the government their share of the taxes, he would have a handsome payoff for himself. But he is clearly interested in Jesus, known as a friend of tax collectors, so climbed a sycamore-fig tree in order to see Jesus when he passed by. Whether he hoped to be hidden from Jesus’ view is not certain, but whatever the case, Jesus summoned him with a request that he provide lodging. The command was obeyed and Zacchaeus showed both repentance and joy as he welcomed Jesus to his house. Outside there were great murmurings about Jesus’ fraternizing with such a man, but Jesus was able to justify his actions – salvation had come to the house of Zacchaeus, a son of Abraham who was as entitled to receive and to hear the Gospel as any other Jew. This act fully and finally summed up the purpose of Jesus’ coming; as a shepherd seeks the lost sheep, so the Son of Man seeks and saves the lost of humanity. John in the Book of Revelation (21:1-4) gives us a picture of how life will be beyond the judgement – a happy and triumphant state of the redeemed church, when all its conflicts shall have ceased and all its enemies shall have been destroyed. This state is depicted by John in the imagery of Jerusalem – for Jerusalem was regarded as a peculiar place for the dwelling place of God, a symbol of a heavenly world. The apostle saw a new Jerusalem coming down from heaven, the church of God in its new and perfect state, beautified with the perfection of wisdom and holiness, as appropriate for the coming of Lord Jesus Christ in glory. The apostle says: “Behold! God’s dwelling place is now among the people, and he will dwell with them…”(21:3). Friends, the blessed presence of God with his church is the glory of the church. You might have been in tears due the heaviness of the load on your shoulders, or faced by afflictions or calamities in one way or another – the apostle assures you that tears are wiped away in Jesus. God himself, as your tender Father, with his own kind hand shall wipe them away. The Revelation of John captures the imagery of the redeemed living in a world with Jerusalem as their abode. Friends, as we launch this new Diocese, I challenge you to see this positive act as the first step on a path towards a world in which you will live as the redeemed, a world in which all tears will be wiped away, all sorrow will cease and God will be with you. However, belief in Christ is the keystone essential to the completion of that promise: without that belief, there can be no church. 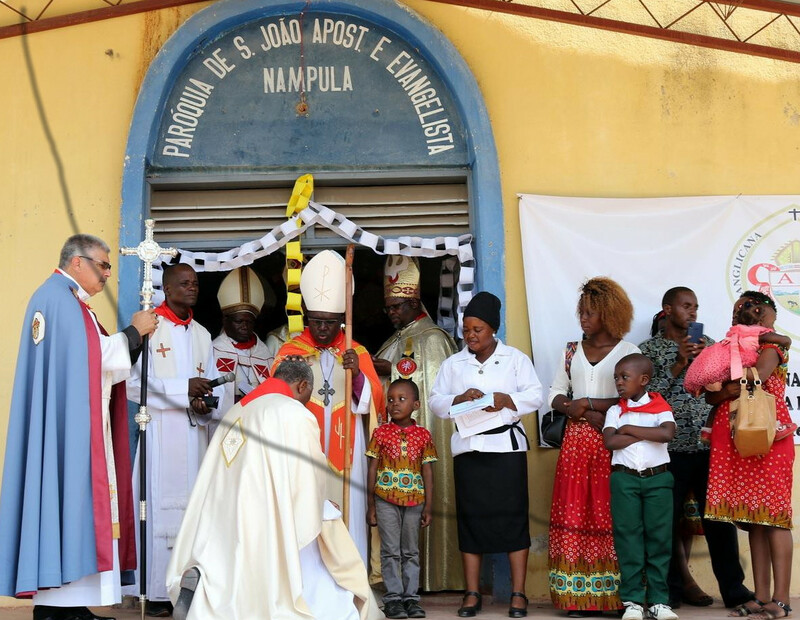 As we gather here to inaugurate this Diocese, you are crucial to the building of the Kingdom of God in this area; without you to remind this community of the presence of God in and around Nampula – wonderful though it is – all human efforts become meaningless. You are persons who derive your life from Christ; Christ who is the original living stone from whom you have come, the life-giving spirit. The whole body of Christ, priests and believers, are to reflect the holiness of God and that of their high priest, to offer spiritual sacrifices, to intercede for people before God and to represent God before humanity. May the Holy Spirit which brought back the resurrected Christ, the Spirit which changed the life of Zacchaeus for the better, and the Spirit which God's people experienced like a rushing mighty wind at Pentecost – may that Spirit transform your lives to be living stones for the foundation of God's church and this Diocese. As the psalmist says, may we be that Jerusalem built as a city where pilgrims gather in unity (Ps 122). As Jesus lives, and because he lives, we shall live also. From grateful hearts, from lips touched by holy fire, let the glad song ring out, Christ our Foundation stone. He lives to make intercession for us. As one writer says: Grasp this hope, and it will hold the soul like a sure, tried anchor. Believe and you shall see the glory of Incarnate Christ. 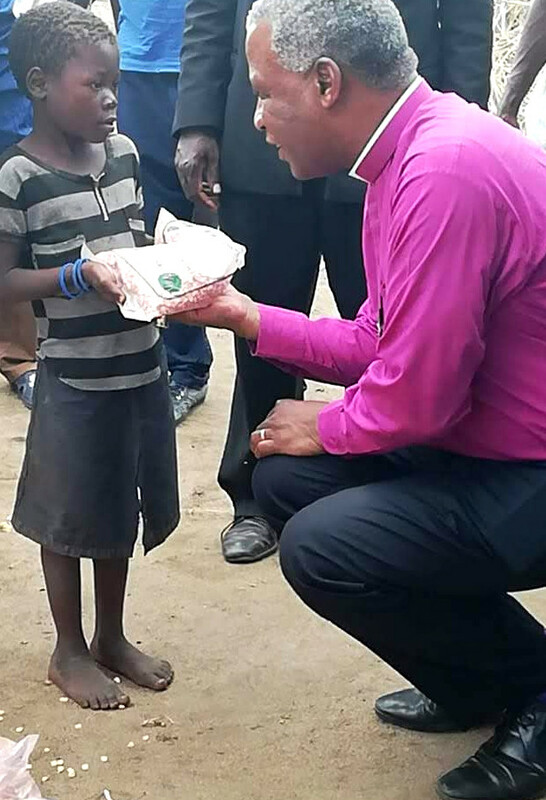 A British international affairs organisation has made an award to Archbishop Thabo Makgoba for his work in establishing a trust to combat poverty and promoting educational skills. "to address the key issues of poverty, inequality and unemployment which are persistent in South Africa and providing educational opportunities and nurturing skills and entrepreneurial talents that have enabled young people to prosper and, in prospering, benefit their local communities." May I speak in the name of the God who is Father, Son and Holy Spirit, Amen. • A Return to God. A message recorded for the #Justice4Vernie rally held in St George's Cathedral, Cape Town, to honour the memory of Vernie Petersen, a former church worker and later a senior civil servant, whose stand against corruption before his untimely death has been highlighted at a commission of inquiry into government corruption. Below the full text of the message is the news release convening the rally, which gives more details. On behalf of the Anglican Diocese of Cape Town and indeed of the whole church, it is my great privilege today to support the campaign for Justice for Vernie. 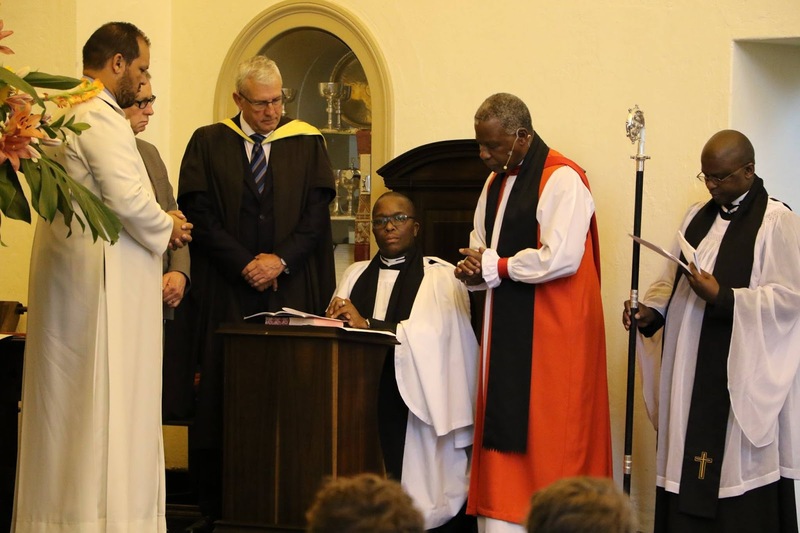 [Anglican News] The Primate of the Anglican Church of Southern Africa, Archbishop Thabo Makgoba, has called on Anglican bishops to attend the next Lambeth Conference despite differences within the Anglican Communion. May I speak in the name of God, our Creator, Redeemer and Sustainer, Amen. Thank you Rob for the warm welcome we received on our arrival here this morning. Thank you for the refreshing worship and testimonies from the confirmation candidates during this service. W. Cape religious and political leaders at Bishopscourt. 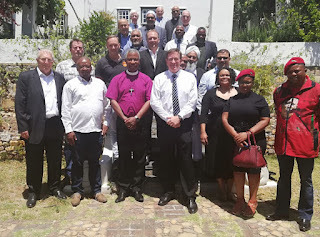 With an eye on the pending national and provincial elections, the Electoral Code of Conduct Observer Commission (ECCOC), chaired by Archbishop Thabo Makgoba, met with representatives of nine political parties active in the Western Cape on Tuesday 29 January at Bishopscourt. The purpose of the meeting was to introduce ECCOC to political leaders. One of ECCOC’s tasks is to ensure that political parties and their leaders understand that they should not incite violence and instability at election times when tensions could be running high. “We help to defuse tense situations where they arise or seem likely, by playing a mediating role at times of stress or potential violence. 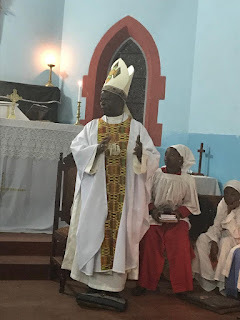 We hope that political parties and the electorate see our presence as helping to ensure that there is a moral presence on election day,” said the Archbishop. He said that ECCOC will have a strong presence at polling stations, acting as an observer. Its presence will stress the need for a moral and value driven election and ECCOC will report any irregularities and inappropriate behaviour by parties to the IEC. The parties present at the meeting indicated support for ECCOC and thanked the Archbishop and his ECCOC team for acting as an independent and impartial influence prior to and on election day. Archbishop Thabo Makgoba will seek the input of the next meeting of the Synod of Bishops in response to the recent resignation of the Right Revd Monument Makhanya, the Bishop of Zululand. He said this in a statement issued after the Johannesburg Sunday Times published a report revealing that Bishop Makhanya had resigned after a former deacon in his Diocese had laid a complaint of sexual misconduct against him. "I very much regret that someone appears to have relayed the content of Bishop Monument's ad clerum (a letter to his clergy) to the press. "As I explained to the newspaper concerned, as soon as the complainant in this matter was willing to lodge a written statement, we followed our Province's guidelines for dealing with such allegations. "Bishop Makhanya resigned during the process which followed, which is still ongoing. I have consulted with the Province's Safe Church Network and legal advisers and will seek the input of the next meeting of the Synod of Bishops on the way forward."